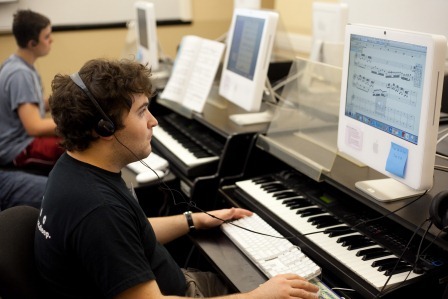 Samford University’s Adventures in Music (AIM) summer program for students in grades 1-12 will celebrate its 25th anniversary June 16-20 and again July 7-11. Each of the week-long AIM sessions will feature a mix of music study and performances, capped by a Friday evening gala and reception. Connie Macon, director of Samford’s Preparatory Music Department, said this year’s programs will benefit from the university’s new Samford Academy of the Arts facilities across Lakeshore Drive from Campus while still introducing participants to the arts resources of the main campus. "Adventures in Music camp was created in 1989 as Samford University's premier music camp,” Macon said. “The combination of collaborative music, solo study, accelerated music theory and music literature classes, and many opportunities for performance combine with the Samford campus experience." Macon said participants will spend Monday through Thursday mornings at the Academy of the Arts, where they will take part in private lessons and ensemble groups, and study theory and music literature. They will spend afternoons on campus in Buchanan Hall for Orff class, computer music, and more private lessons and ensemble groups. Each of those days will feature a guest artist in the afternoon. Participants will spend all day Friday on campus for the traditional AIM scavenger hunt, a Who Wants to be a Music Millionaire game, solo recital and the evening gala.